With the notification system, you are always up-to-date on all events that you consider important. Almost all modules allow users to configure when to receive notifications. All configured messages are only created for the currently registered Password Safe user. It is not possible to create a notification for another user. Each user can and should define himself which passwords, which triggers as well as changes are important and informative for him. The configuration of visibility is explained in a similar way to the other modules in one place..
*The reading pane is deactivated in this module by default. It can be activated in the “Display” tab in the ribbon. There are also some ribbon functionalities that are exclusively available for the notification module. 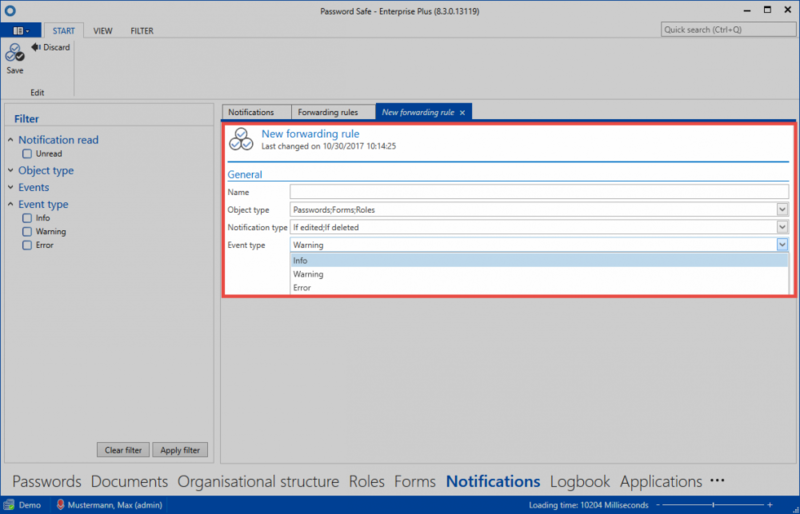 In particular, the function Forward important notifications to email addresses enables administrators and users to maintain control and transparency independent of the location. The two buttons on the ribbon enable you to mark notifications as read/unread. In particular, the filter criterion available in this context (see following screenshot) enables fast sorting according to current and also historical notifications. 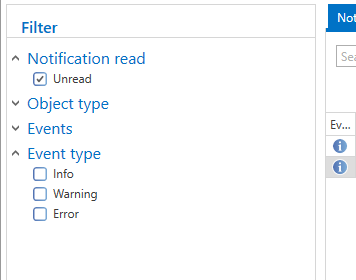 It is possible to mark the notifications as read/unread via the ribbon and also via the context menu that is accessed using the right mouse button. If the corresponding setting has been activated, opening a notification will also mean that it is marked as read. Various forwarding rules can be defined via the ribbon. A rule defines when a notification should be forwarded to email. In this example, all notifications that match the stated object type (passwords, forms, roles) and notification type (when edited, when deleted) are forwarded. 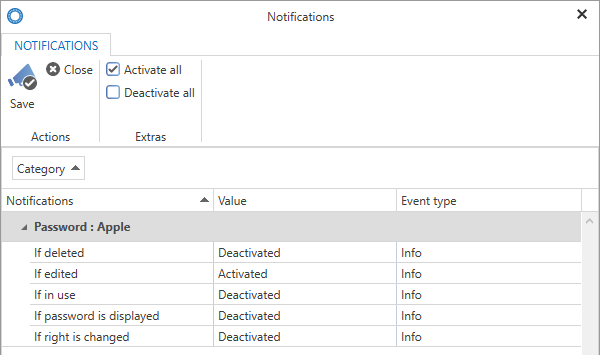 In addition, it is also possible to filter according to the notification type (=event type). Value: Defines whether a notification should be created for the previously defined trigger. In the example for the “Apple” record, this only occurs when the record is edited. Event type: The event type for the generated notifications can be either “Info”, “Warning” or “Error”. This information can also be used e.g. as an additional filter criterion. In contrast to previous editions, it is best to configure the notifications manually. This ensures that a notification is really only triggered for relevant events. As well as manually configurable notifications, there are other triggers in Password Safe which will result in notifications. System tasks: If reports are automatically created via the system tasks, these are also made available in the form of a notification. If this type of notification is selected, it can be directly opened via the corresponding button that appears on the ribbon. If desired, notifications can be automatically cleaned up. This option can be configured on the AdminClient. Further information can be found in the section Managing databases.